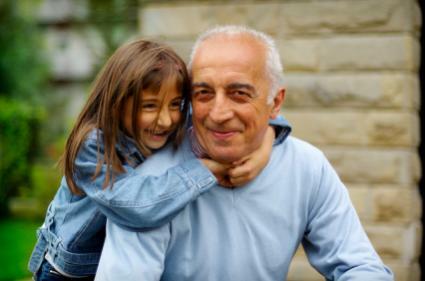 Did you know that grandparents can play an important role in bullying prevention? Grandparents and grandchildren often have a special bond that is unique from other relationships children have with adults. Children who feel embarrassed or ashamed to tell a parent or a teacher about a problem may instead turn to a grandparent for comfort and support. Showing grandchildren love, concern, and reassurance is important. But children involved in a bullying situation also need specific help and guidance. When grandparents have a clear understanding of what bullying is and how to address it, they can help keep their grandchildren safe. "Many grandparents love to tell stories of when they were young. Sharing a story about when a grandparent experienced bullying may encourage a grandchild to share his or her concerns about bullying before it becomes a problem." Many children who are bullied are reluctant to tell someone because they believe that nothing can be done about it or that telling someone will make the situation worse. But children who regularly turn to their grandparents for sympathy and comfort may confide in their grandparents about a bullying situation. In fact, a recent AARP study reported that more than half the grandparents surveyed reported talking with their grandchildren about bullying. According to the U.S. Census Bureau 2010 Survey, 7 million grandparents live with their grandchildren, and 2.7 million are responsible for the basic needs of one or more grandchildren. Many parents welcome the help and support of grandparents for raising their children and addressing problems. Since bullying prevention is most effective when children receive consistent messages about bullying, grandparents should communicate openly and regularly with parents about issues of bullying. Children can benefit when grandparents, along with parents and teachers, teach them effective ways to prevent and respond to bullying. Grandparents will be best prepared to help their grandchildren if they have a solid understanding of the behaviors that constitute bullying. Bullying is a serious problem that requires immediate attention and a well thought out response. We know much more about bullying now than when grandparents were children or even parents of young children. Bullying is not just “kids being kids,” and being bullied doesn’t make children stronger. We now know that bullying can have damaging short- and long-term effects. And, through research and best practices, we now have effective strategies for preventing and stopping bullying. It’s important to know who’s involved in bullying. Grandparents may be concerned that their grandchild could be a victim of bullying. However, they should also realize that their grandchild may be involved in doing the bullying. And even if their grandchild isn’t being bullied or bullying others, he or she may be a bystander. Over the past two decades, we’ve learned more about the important role that bystanders play in bullying, and it is rarely neutral. Bystanders can actively contribute to the bullying by laughing or joining in, they can passively contribute by watching the bullying happen without intervening, or they can help stop the bullying by supporting the victim and getting help. 1. Let their grandchild know that they take bullying seriously. Sympathize, show concern, and ask for more information. 2. Determine if the problem is really bullying—has someone intentionally and repeatedly used words, actions, or relationships to hurt their grandchild, and does the situation involve a power imbalance? 3. Ask the grandchild if he or she has told another adult about the situation. If not, grandparents can encourage the child to tell his or her parent(s). 4.If warranted, a parent or grandparent can discuss the situation with the child’s teacher. Teachers may be able to help solve the problem through working with the school’s bullying prevention protocols. 5.Offer effective ways that the child could respond to bullying. For example, role-play how to stay calm and speak up assertively in a bullying situation, and brainstorm a list of trusted friends or adults who could help. The child’s parent or teacher might have other suggestions as well. 6.Make sure that an adult follows up to confirm that the bullying stops. The best way to stop bullying is to prevent it before it starts. Many grandparents love to tell stories of when they were young. Sharing a story about when a grandparent experienced bullying may encourage a grandchild to share his or her concerns about bullying before it becomes a problem. Grandparents can use these stories to help grandchildren understand that bullying is never acceptable and that there are ways to stop it. Some children take advantage of time with their grandparents to use the computer or other digital devices. Although grandparents may feel intimidated by unfamiliar technology, they don’t need to keep up with the latest tech gadgets to keep their grandchildren safe. Rather, they should pay attention to changes in children’s moods when using these technologies. Grandparents should realize that if a grandchild becomes upset after spending time on the computer or cell phone, he or she may be involved in online bullying, known as cyberbullying. Grandparents should supervise a grandchild’s use of computers and other digital devices, explain their concerns about cyberbullying, and be prepared to offer advice. If a grandchild is experiencing cyberbullying and the grandparent is concerned for the child’s safety, grandparents should make sure to inform the parents, the school, the local police, the social media site, and/or the service provider. In today’s world, bullying is an all-too-common problem that can happen to any child at any time. Children can benefit from the support of the many caregivers involved in their lives—including their grandparents. When grandparents learn about bullying and how to prevent it, they can be prepared to offer the help and support their grandchildren may need. Children who are victims need to learn to stand up for themselves and ask for help. Children who watch bullying happen need to know they have the power to stop it. Children who bully need to know that bullying hurts and that bullying is never allowed. When children receive these messages from the many different adults in their lives, including grandparents, they will come to understand that bullying will not be tolerated anywhere, and they will be better equipped to overcome bullying if and when it does occur. For more information on bullying prevention visit Eyes on Bullying. We’d like to hear your thoughts. Do you have an experience to share about a grandparent helping a grandchild prevent or stop bullying? Please leave your comments below.